This is the third game in the Smash Bros. series. The majority of the gameplay is unchanged since the first game and so I shan’t go into much detail about how exactly the game is played and will instead talk about the changes and additions that this instalment brings with it. The best thing about this game, I thought, was the inclusion of a storyline called The Subspace Emissary. 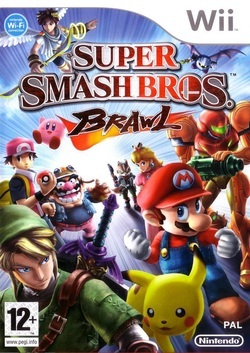 The story brings all of the characters together as they fight against the Subspace Army who have allied with a couple of Nintendo’s better known villains. Every level is a side scroller where each character controls exactly as they would do in other modes. These levels all look quite nice (ranging from forests to power complexes) and, after each level you’ll get to see excellent cut scenes of the various heroes getting on with their quest and interacting with one another. While nobody ever talks, the storyline is still very exciting and often tense and emotional too. This story mode is definitely the thing to buy the game for as the whole thing has a rather epic feel. And I think the word ‘epic’ is a little overused, but, it definitely should be applied to this story. The old modes are still in the game too though (other than Adventure mode, which is gone) and this time the roster of characters has been extended to include non-Nintendo characters too (although, at the same time, Roy, Dr. Mario and Mewtwo are all sadly gone). You can now play as Sonic from the Sonic series and Snake from the Metal Gear series both of whom are characters that I enjoy playing as very often. Using (and unlocking) the new characters is a good enough motivation for playing through the older modes. Plus, for the first time you now have the ability to have fights online and while it does feel slightly limited, it’s still very fun to be able to play against strangers and convenient to be able to play against friends. There’s also a new item called a Smash Ball which gives every character a unique and very powerful ability (Bowser, for example, becomes the giant Giga Bowser) which gives a fun new spin to the battles. Finally, the unlockables have been greatly expanded too. The trophies have returned from the previous game, except this time there are a lot more of them (and there were already loads). Plus, a new trophy feature allows you to pose them on little sets and take photographs, which is quite cool. As well as trophies, there are now stickers to collect too. These stickers are pieces of artwork from various Nintendo games and can be used to give power ups in the story mode, but basically they’re just fun to collect and there are hundreds of them too. CDs are another collectable. Each of these will give you a popular song from a Nintendo, Sonic or Metal Gear game which will then be heard from time to time in various levels that match them. Since I really enjoy video game music, I was very happy that so many tracks could be unlocked (even songs from Tetris! ).